On 01/12/2017 we made the first dig of a residential building located on boulevard Lomsko Shose. Investor and contractor of the building is Idea Home and Studio Creative is the designer. 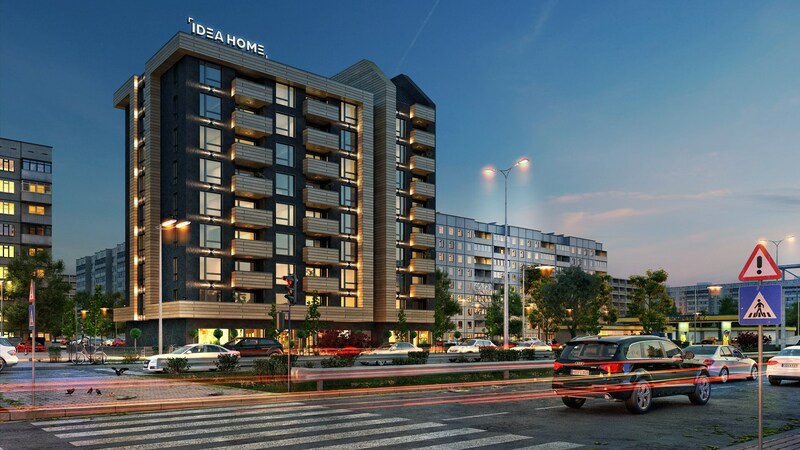 The project is a multifamily residential building "Sofia" situated on a convenient and visible location on property located between Boulevard and inner-neighborhood street. The requested style of the building is modern, with large and clean shapes, highlighting the clear composition of volumes, lined with HPL blades protruding from the plane of the facade, which is decorated in dark gray siliceous plaster. Here you can see the project of residential building "Sofia"
Functionally the building is designed as nine floors above ground and one underground level and is provided for housing, shops, garages and underground garages. Levels are utilized as follows: On the underground floor there are 24 parking spaces, evacuation and vertical communications. On the ground floor or elevation ± 0.00 there are eight stores and six double garages and the entrance to the residential part. From the first to the eighth floor there are three three bedroom apartments, three two bedroom apartments, a studio and a staircase with an elevator.